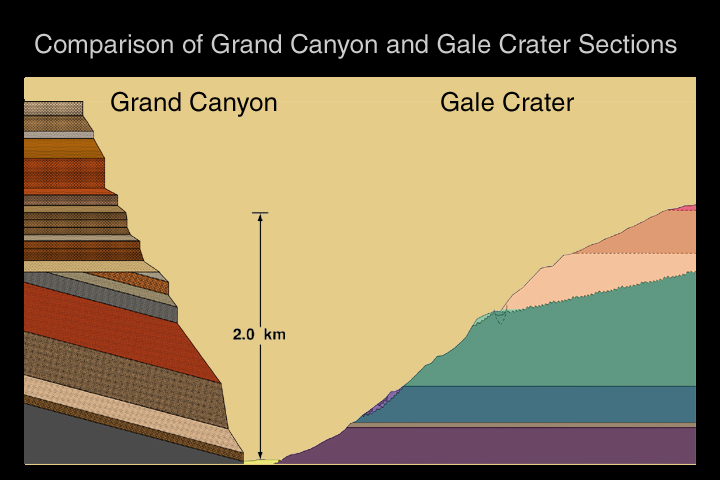 This sketch compares the thickness of the section of layered rocks exposed in the walls of the Grand Canyon in Arizona with that of the layered mound in central Gale Crater. In the case of the Grand Canyon, rocks portrayed as horizontal in the diagram were formed within the past half-billion years. Rocks that are tilted (dipping) are more than a billion years old. 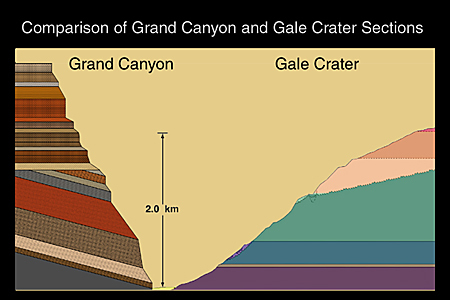 Comparable thickness does not necessarily mean comparable age, as different processes and time scales are involved in the formation of each rock unit, and there are gaps in the geologic record when rocks were not formed (both in Gale Crater and in the Grand Canyon). On the other hand, even on a intensely geologically active planet like the Earth (and in a place such as the Colorado Plateau where the Grand Canyon is located), it took many hundreds of millions of years to create sedimentary rock deposits of the thickness comparable to those observed in the martian crater. So it is likely the martian rocks record a considerable amount of time. Equally interesting are the timescale and processes responsible for erosion. We know in the Grand Canyon that downcutting by the Colorado River and subsequent mass movements to widen it were responsible for exposing the rocks there. What processes caused the rocks in Gale Crater to be eroded such that there is now a 2-4 km (1.2-2.5 mi) high mound of layered sedimentary rock left in its center? No one knows. "Oblique View of Gale Crater Mound, MOC2-265E"
"Layered Unit in Gale Crater Mound, MOC2-265F"
"Unconformity in Gale Crater Mound, MOC2-265G"
"Massive Unit in Gale Crater Mound, MOC2-265H"
"Sediment History Preserved in Gale Crater Central Mound, MOC2-260"
"Layered Rock in the Grand Canyon, MOC2-265K"